Archdiocese of Wellington – What is your armour? Home » Wel-com » What is your armour? WelCom July 2017: St Michael’s Church Youth Group Taita, of Lower Hutt’s Te Awa Kairangi Parish, hosted their fourth annual youth fellowship over Queen’s birthday weekend. Lead vocals Vaegaau, Tamara, Isbella, Siaiga, Noelle, with Frank on bass. 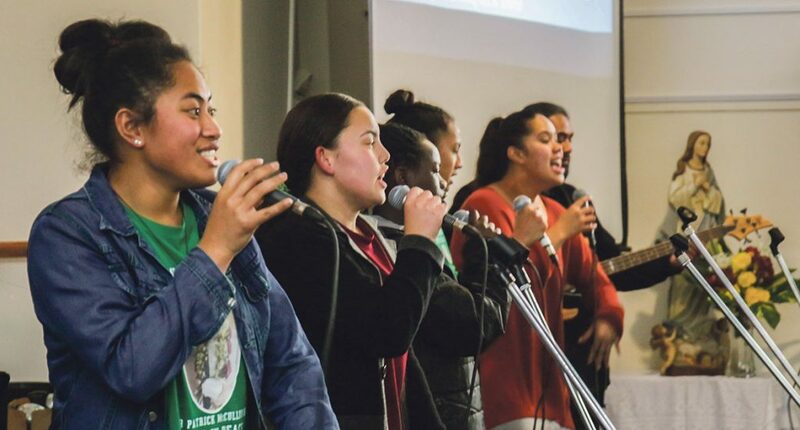 Led by guest MC Viane Makalio of the Christchurch Youth Team, this enjoyable event held in Taita brought together around 80 youth from within our Wellington region. Parish priest Fr Patrick Bridgman and his team, Presentation Sisters from Taita, Sisters of the Missionaries of Charity and Chris Duthie-Jung from the Family and Young Church Office all took part in this fun event. The theme ‘What is your armour?’ captured the youth audience and was presented creatively by the hosts. Discussions included a testimony by guest youth speaker Elsa Su, videos from youth ministers, as well as skits by St Michael’s Church Youth and soulful music by St Michael’s Church Youth band. Young people had a great time in each other’s company, sharing their thoughts about the theme, while praising God through singing, prayer and dancing. The St Michael’s Church Youth group has been running for seven years. The group was initiated by the late Fr Pat McCullough, led by Iosia Misa and MaryAnne Misa, with help from Failagi Filipo, Noelle Faka’osi, Frank Vagana and Calem Sua. An incentive set by this team of gifted coordinators, is to bring youth together in the name of our Father, and fellowship as the youth of the Catholic Church. Over the years of hosting this spiritually-fulfilled event in the Hutt, there is a strong desire from our youth for such events. St Michael’s Church Youth Taita looks forward to continuing to hold this annual event.